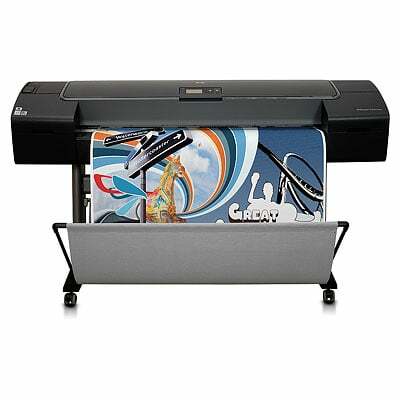 Thank you for your question about the HP Designjet Z2100 Photo Printer. From HP's official website, it appears that the latex inks they manufacture are designed to be compatible with HP latex printers only, those being the HP Latex 3100, HP Latex 3500, HP Latex 3600 and HP Latex 3800 specifically, meaning your HP Designjet Z2100 Photo Printer would not be suitable for HP latex ink cartridges. I hope this helps, if you require any further information or assistance please do not hesitate to contact us. What is "PK" for the Z2100 printer please? Hi, what's the largest paper size that I can use to print pictures on with the Designjet Z2100 photo printer? For all sorts of printing needs, the HP Z-2100 Photo excels. After some time your HP Z2100 Photo will gobble up all of your printer ink, and when it does you'll soon see that buying HP Z2100 Photo ink may be really expensive. Thankfully, however, you don't need to get stressed about paying the high asking prices you'll find on the main street because right here at Cartridge Save you can find all the HP Z 2100 Photo cartridges you will ever need at really low prices. Save more money on your ink by shopping online at Cartridge Save! Why waste money to buy the Z-2100 Photo original cartridge or Z2100 Photo compatible ink on the main street when it is much more simple to save your hard earned money shopping online with Cartridge Save. Get one hundred per cent peace of mind when you buy your Designjet Z2100 Photo ink cartridges from us as everything is guaranteed by a no quibble money back guarantee. Keep in mind that each purchase also comes with free delivery, normally arriving with you the following business day! Designed for printing businesses and advertising firms, the HP Designjet Z2100 Photo is a large format printer that delivers impressive images and photos on a wide range of media. It employs i1 colour technology by using an embedded spectrophotometer. However, the HP Designjet Z2100 Photo is one of the more expensive printers in its class with high printing costs. This large printer weighs 143 lbs and measures 49.7 x 27.2 x 41.2 inches. It comes with document finishing including an automatic cutter, which can cut all types of media excluding canvas, and roll feed plus sheet feed. The HP Designjet Z2100 Photo large-format printer has a print speed of 2 minutes per page on draft mode and a maximum print resolution of 2400 x 1200 dpi. Built-in memory is 128 MB, and the hard disk is 80 GB. Users can expect excellent quality prints from the HP Designjet Z2100 Photo inkjet printer. This workhorse can continuously print for 300 feet and it can handle banners, textiles, and other hard media. The Designjet Z2100 large-format photo printer is compatible with Macintosh and Windows computers plus it offers fast Ethernet for networking. The HP Z2100 Photo printer only offers USB and Ethernet for connectivity; Wi-Fi is available but must be bought separately. The HP Designjet Z2100 Photo's inks require frequent changing and come in nine different shades of colour, driving running costs up.